While this unilateral termination rule was plainly intended to protect franchisees, there are rare instances in which the protection backfires. One of these rare instances is present in the recent California Central District case of Fantastic Sams Salons Corp. v. Moassesfar, 2015 U.S. Dist. LEXIS 6934 (January 21, 2015). As discussed below, in the Fantastic Sams Salons Corp. v. Moassesfar case, the franchisee’s attempt to shield itself from liability by invoking the automatic termination provision in its franchise agreement fails when the district court finds that the notice and opportunity to cure requirements of the CFRA negate any automatic termination. With over 1,250 franchise locations, Fantastic Sams Salon Corp. (“Fantastic Sams”) is one of the largest full-service haircut and beauty salon chains in the U.S. In February 2007, Frank and Parvaneh Moassesfar entered into a franchise agreement with Fantastic Sams allowing the Moassesfars to open and operate a Fantastic Sams salon in Tarzana, California. Later that same year, in November 2007, the Moassesfars entered into a second franchise agreement for a salon in Northridge, California. The franchise agreements required the Moassesfars to pay weekly licensing and advertising fees to Fantastic Sams. These fees were to be automatically debited by Fantastic Sams from separate bank accounts for each of the Moassesfars’ salons. After several years of operating their salons without incident, in January 2011, Fantastic Sams’ attempt to debit the Moassesfars’ weekly fees for the Tarzana salon failed. This was allegedly due to the Moassesfars closure of the bank account. Although no fees were being paid on the Tarzana salon, it appears that the Moassesfars continued to pay the licensing and advertising fees for their Northridge salon for another year. However, in February 2012, this too stopped. Remarkably, for the next two years, the Moassesfars allegedly continued operating the salons, royalty free, and Fantastic Sams made no effort to enforce the terms of the franchise agreements or collect the past due fees. Then, on May 30, 2014, Fantastic Sams sent the Moassesfars a notice of default – with a five-day cure period – for both salons. The Moassesfars failed to cure the defaults and Fantastic Sams filed suit on August 27, 2014. Shortly after the lawsuit was filed, the Moassesfars stopped operating the salons and the parties entered a stipulation effectively terminating both franchise agreements. As a result of the stipulation, the only issues before the court concerned Fantastic Sams’ pursuit of damages for breach of contract and trademark infringement. The Moassesfars responded to the complaint by filing a motion to dismiss relying entirely upon automatic termination and contractual limitation provisions in the franchise agreements. First, the Moassesfars cited to paragraph 12(b)(2) of the franchise agreements, which provides that the entire franchise agreement automatically terminates when two consecutive payments are missed. 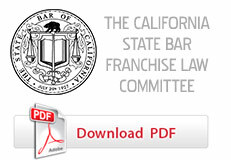 Second, the Moassesfars argued that, consistent with paragraph 12(b)(2), their franchise agreements automatically terminated – the Tarzana franchise agreement in January 2011 and the Northridge franchise agreement in February 2012 – after they failed to make two consecutive payments in connection with each store to Fantastic Sams. Applying the above facts, the Moassesfars concluded that, because the franchise agreements had been terminated for more than a year before Fantastic Sams initiated the instant action, Fantastic Sams was barred from pursing any contract damages. Except as otherwise provided by this chapter, no franchisor may terminate a franchise prior to the expiration of its term, except for good cause. Good cause shall include, but not be limited to, the failure of the franchisee to comply with any lawful requirement of the franchise agreement after being given notice thereof and a reasonable opportunity, which in no event need be more than 30 days, to cure the failure. The court found that the notice and opportunity to cure requirements of the CFRA negated any automatic termination of the Moassesfars’ franchise agreements notwithstanding the language of paragraph 12(b)(2). Because the Moassesfars continued operating their salons after missing consecutive payments, the court found that they were still obligated under these other provisions in the franchise agreements to continue paying the license and advertising fees to Fantastic Sams. Although Fantastic Sams defeated the motion to dismiss, it still faced some adverse consequences for neglecting to timely enforce its franchise agreements. As mentioned above, Fantastic Sams waited more than three years to take any action for the Moassesfars’ missed payments under the Tarzana franchise agreement, and more than two years to act in connection with the violations under the Northridge agreement. In the meantime, the Moassesfars continued to operate the salons, royalty free. While the court ultimately found that Fantastic Sams was not barred from pursuing both breach of contract and trademark infringement damages in the case, the court did find that the contractual limitations provision in the franchise agreements barred Fantastic Sams from pursuing any damages that pre-dated one-year before the filing of the lawsuit. Keep in mind, Fantastic Sams may have gotten off lightly. Neglect of this nature by a franchisor often not only results in significant lost fees, but also emboldens other franchisees to follow suit, causing irreparable harm to a franchise system. Bus. & Prof. Code Sec. 20000 et seq. Bus. & Prof. Code Sec. 20020. Fantastic Sams Salons Corp., 2015 U.S. Dist. LEXIS 6934 at *8 (citing to Cal. Bus. & Prof. Code §§ 20020, 20021). Paragraph 3(b)(1) of the franchise agreements. Paragraph 12(e) of the franchise agreements.